Year 2025. A typical weekday in Amy’s life. 7:30 AM: Amy gets a weather alert and traffic update on her smartphone and decides to work from the office on that particular day. She updates her availability on the collaboration work tool. 8:30 AM: A driverless cab arrives to pick her up. It is WIFI-enabled and allows her to work on files that are stored on the cloud on the way to the office. Amy receives an alert displaying the available workstations for her to choose, based on the type of work and the amenities that would be required for the day. 9.00 AM: Her smart badge, an RFID-enabled ID card, automatically records her presence as soon as she enters the office. The light and temperature of her chosen workstation are automatically adjusted based on her pre-set preferences. 10:00 AM: As always, she starts her day by accessing the coffee vending machine through a mobile app that delivers the drink through a humanoid robot. 12:00 PM: Amy then goes to a collaborative discussion room for a meeting with a 3D holographic telecast of her boss sitting several thousand miles away. The room has smart white boards which replicate the text at her and her boss’ end. 1:00 PM: During lunchtime, Amy checks with her virtual assistant (VA) for the menu of the day and asks the VA to place the order. 4:00 PM: While working on a new feature of a product, she uses an augmented data discovery tool to search for a base algorithm on top of which a new code can be built. 4:15 PM: While writing the code, she turns on a real-time code testing application that automatically identifies bugs in the algorithm and suggests corrective steps. 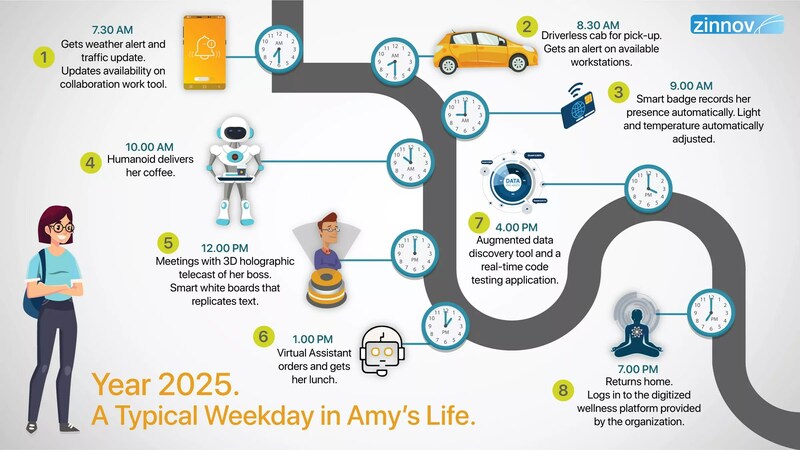 7:00 PM: Amy returns home and logs in to the digitized wellness platform provided by the organization. Using this, she attends a virtual meditation class that helps with her mental wellness and rejuvenation for the next day. A decade ago, this would have sounded like part of the plot of a far-fetched sci-fi movie. But today, we know that the pace at which companies are adopting new-age technologies, this could very well be a reality in the next few years. From mailrooms to emails, from suggestion boxes to online surveys, workspaces have and will continue to evolve with the increasing involvement of technology. 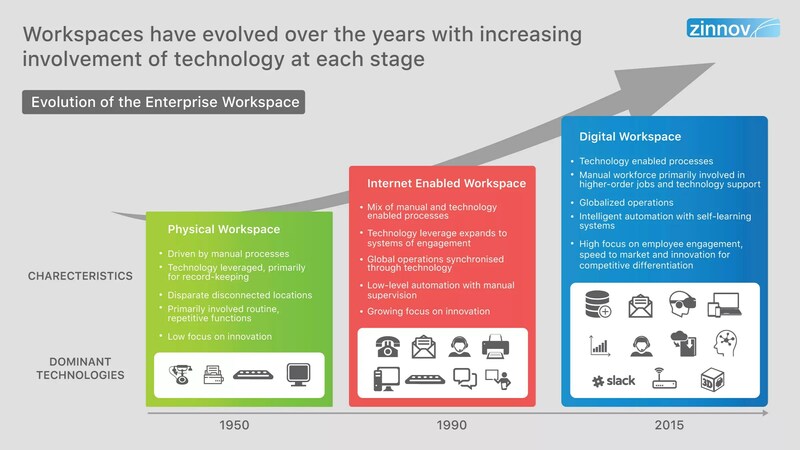 The way employees and technology interact at a workplace has changed gradually over the years. However, over the last 5 years, technology has shifted gears and is heading at us at a lightning pace. There is a no different way of saying that companies need to embrace this speed and the change, and evolve at the same pace as technology. Given below is a snapshot of this evolution. 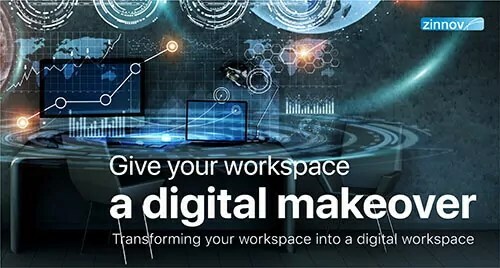 The idea of digital workspaces is going to transform at a fast pace as newer technologies disrupt Digital Workspaces and make them more than ‘Work from Homes’ and ‘mobility’. Today, it is about delivering a seamless user experience, security, and innovation. 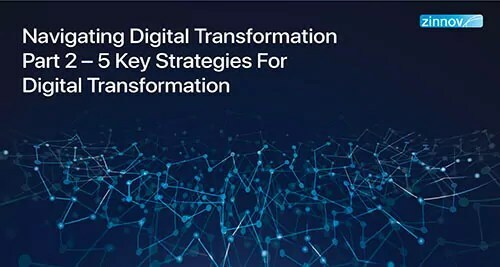 At Zinnov, we define a digital workspace as the application of new-age technology to people, process, and places to enable a truly ‘SMART, EMPOWERED, AND CONNECTED ENTERPRISE’. We carry our workspace in our pockets and wear it on our wrists. It wouldn’t be wrong if we stated that it is only the beginning of truly digitized and connected work culture. But the big question is, what are some of the use cases that Digital Workspaces can solve for? What do companies stand to gain from the implementation of Digital Workspaces? The battle to acquire top talent is on, and Digital Workspaces have a major role in attracting, cultivating, engaging, and retaining the talent in an organization. Across the talent value chain, digital workspaces can propel hiring, L&D, employee engagement, and the overall employee experience. Employees today, look beyond paychecks and benefits. They want to make a profound impact on the organization. 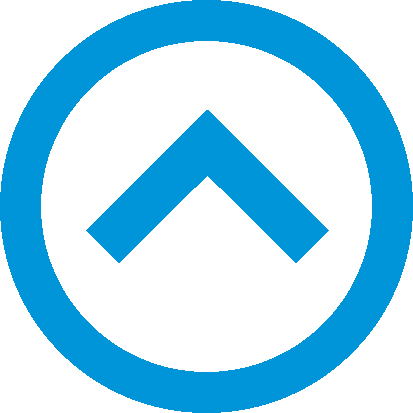 If an organization is looking to acquire the best and the brightest talent in the industry, it must establish itself as forward-looking and committed to technology. Having a workspace that embraces ‘Digital’ will not only attract the best talent but will also help bring out the best in an employee through increased collaboration and efficiency. Some of the technologies that companies are adopting to establish themselves as Digital Workspaces are AR/VR, chatbots, advanced learning and development platforms, etc. Infrastructure remains one of the most sought-after use cases of digital workspaces. Employees today expect a workplace infrastructure that offers dynamic collaboration and drives innovation. As millennials enter the workforce, they look for an organization that is compatible with their M.O. (modus operandi). They need a workplace that provides top-notch facilities, latest technologies, and of course, flexibility. To engage with the millennial workforce, organizations must look at these aspects as they merge their existing infrastructure with digital. Companies are already devising ways to add enticing elements to their infrastructure that will help them improve employee experience, gain business excellence, and save costs. Some of the instances are Smart Badges, Smart writing boards, Intelligent workspace allocation, user preference-based lighting and temperature control, etc. Governance, risk, and compliance management remain one of the biggest issues for a lot of organizations. Lack of good governance can stifle a company’s growth, and at the same time, present barriers in their strategic goals. Digital workspaces can be instrumental in stimulating innovation and driving good governance. It will help organizations make everyday operations smoother and more efficient through the use of various apps and technologies that give employees flexibility without compromising security. 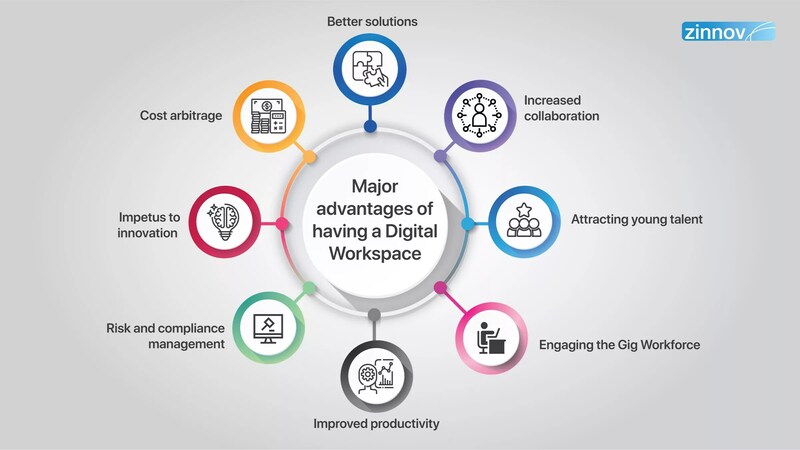 Digital workspaces can also optimize IT & Operations by using new-age technologies like smart business applications, real-time collaborative knowledge management, smart facility management, and Intelligent Records Management, etc. 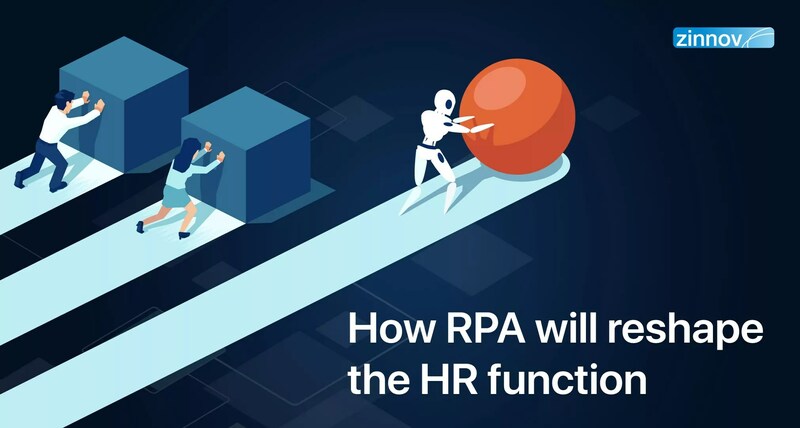 Several elements of governance and operations have the potential to get automated; for instance, automated compliance management, workflow management, data management, and so on. Digital workspaces can thus open new avenues for organizations to automate. In a nutshell, implementing a digital workspace can help enhance an organization’s governance and operations strategy and ensure compliance. Why do you need a digital workspace yesterday? 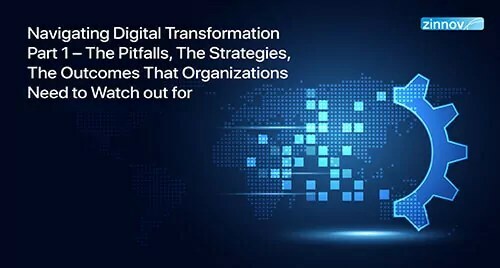 While companies decide to implement digital workspaces, they also need to assess where they stand on the path to Digital Workspaces, keep an eye on the desired outcomes, manage the investments, calculate ROI, etc. In the process of doing so, they can get a sense of what is happening in an organization. It is a data-driven decision-making process and can help the management gain clarity and the pulse of the organization. This insight into an organization’s current state comes as another by-product of implementing digital workspaces. 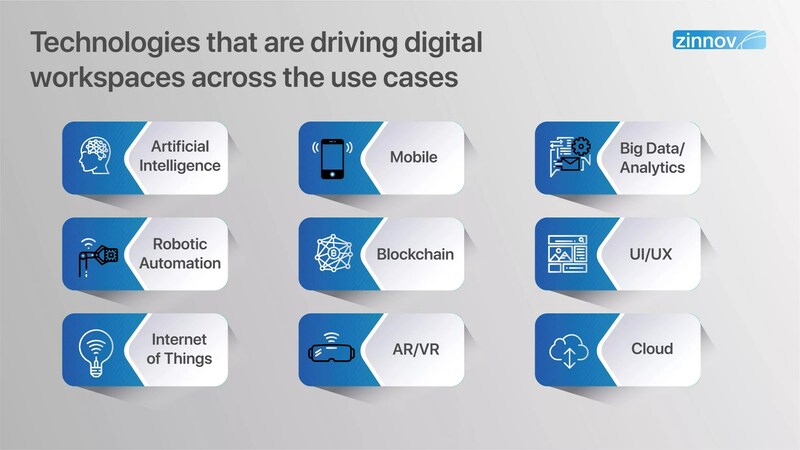 Several organizations have already explored these use cases and are reaping the benefits of having a fully digital workspace. As the war to attract the future skills gets intense, it becomes all the more important for companies to look like the future. The aim for every organization today is to engage with ‘Amy,’ make sure she joins their workforce, feels one with the workspace she is in and stays with the company for a sustained period. Her experience as an employee should drive the organization’s business and innovation agendas every day. At the end of a workday, Amy must feel that her workspace is hers, digitally hers. 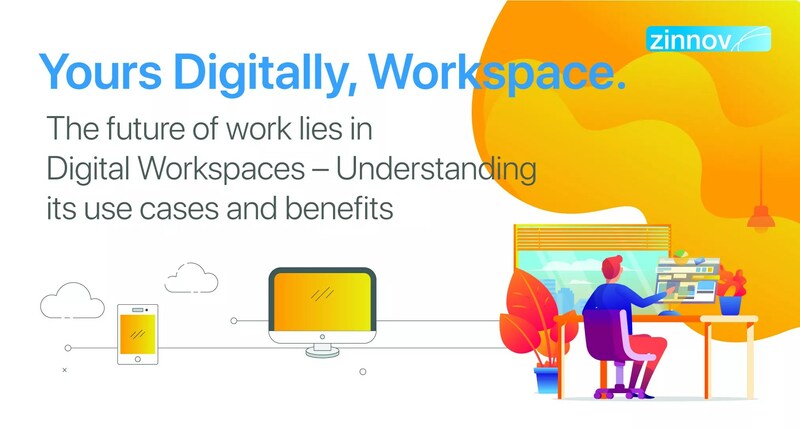 The future of work lies in Digital Workspaces and it is important for companies to understand its use cases and benefits to be able to infuse digital in their workspaces.